This doesn't look like pie, does it. It's the "for the masses" version. I took one of these cookie sheets of pie to a funeral luncheon and one to my grandson's baptism luncheon. Here's what the regular size looks like. It's delicious. Maybe you should make some. Here is the recipe for a pie size. The recipe for a cookie sheet size--which serves 20 with nice generous squares follows. Spray pie plate with vegetable spray. Blend one minute. Pour into greased pie plate and bake for 30-35 minutes. 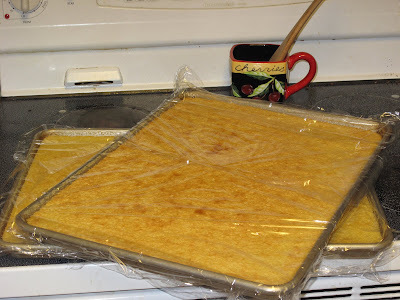 BUTTERMILK PIE FOR THE MASSES--Makes a cookie sheet full--17x12 inches. This is tricky in a blender. If your blender won't handle this much liquid make halfish of it and pour it into a bowl and then make the remaining halfish, mix them together and pour into greased cookie sheet. 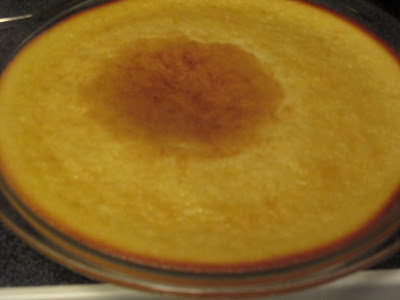 1 1/4 cups Bisquick--I use pancake mix because I never have Bisquick in the house. Blend really well in blender--maybe in two batches--and pour into greased cookie sheet. Bake 35 minutes.